Very nice looking rod and heavy duty. 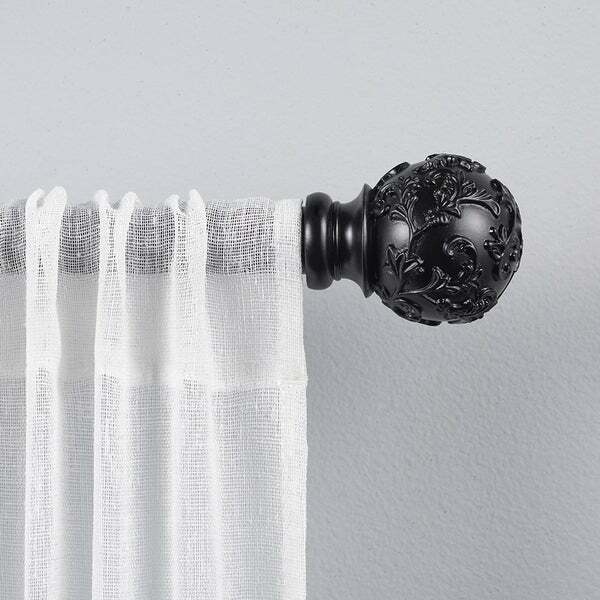 The Vine decorative curtain rod and finial set features a timeless, romantic style and floral design with a matte finish iron rod and coordinating cast resin vine sphere shape finials. This set will provide a visually balanced appearance for your window treatments. The 2.5" diameter x 3.1" long finials will insure that your window curtain panels will remain securely on the rod. The 1" diameter iron adjustable curtain rod is designed to fit a wide range of window widths, and has a sturdy 25 lb. capacity that will support flowing sheers to thermal blackout panels. The 3.5" fixed depth projection bracket provides a gracious amount of space for fabrics to drape perfectly. Accommodates window curtain panels and drapes that are designed with various tops, including: rod pocket, pinch pleat, grommets, tab top, or hidden back tab top. Provides an attractive accent to every window treatment in your living room, bed room, bathroom, kitchen, and kids room. Installs easily with included hardware and installation instructions. Sturdy, easy clean, no fuss, wipe clean finish will last for lifetime. This window curtain rod and finial set will add the perfect finish accent to any window treatment and adds a refined style to your home decor. Absolutely beautiful. I was pleasantly surprised how elegant it looks in person. With hanging six curtain panels, I went with longer screws for extra strength. Easy to install, took me about 15 to 20 minutes, and my curtains were up. Would definitely recommend. Stunningly clear detailing on the finials. I really like the larger diameter on the rod itself, I think the smaller rod look cheep. For this price this was a great purchase. Matches the rest of my decor also. The rod was very simple to install. Although it feels slightly cheap, it doesn’t look cheap on the wall. I did not hang heavy curtains on it, they are very light. Overall great item for the cost. The ends were nicked. I turned the damage to the wall as I didn’t want the hassle of returning them. Also the instructions, or lack thereof, were terrible. There was an extra rod included that had no purpose and didn’t fit either of the other rods included. These are nice rods. I ordered two. The color is good- they look like the pictures. Nice detail and color on the finials. I am happy with the purchase. They are nice. The bracket makes them stick out from the wall a little more than I like, but the rod itself looks as shown in the photo. Very nice rods for price. I looked in stores and decided to purchase these as they appeared to be as good or better quality. Very satisfied. This came to me damaged and we had to hammer out the bent finial which was also chipped and make do. The item was chipped and few scratches on the rod itself. I chose it because I think the finish and the decoration on the finials March my new bedset i purchased! "what does the medium and large size option refer to? There are three lengths from which to choose....so, it begs the question ... is it the diameter of the rod itself? If so, what exactly are the options? 1", 1.5" round etc...."